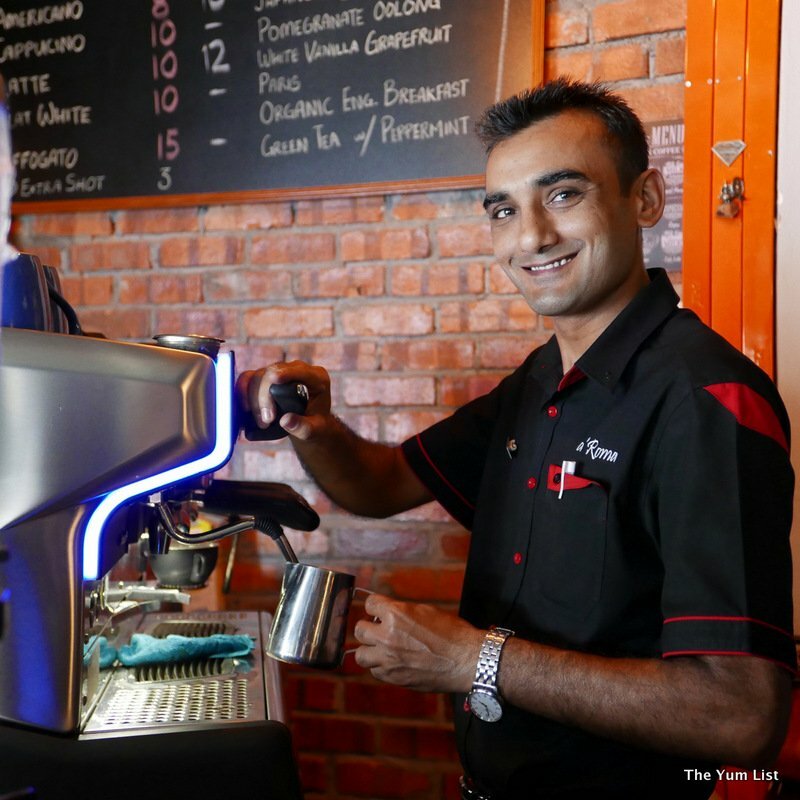 Nestled away in the 40 year old neighbourhood of PJ section 20, otherwise known as Taman Paramount, sits the delightfully authentic new Italian spot – a’Roma Dinings. Brought to life 9 months ago, we’re sure more foodie destinations will pop up here in the coming months as this area seeks to undergo gentrification. 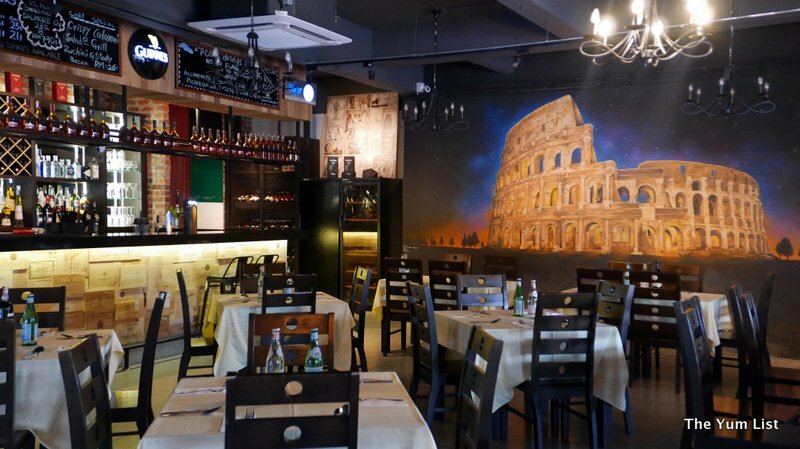 One of the first things that catches your eye as you enter the restaurant is the giant mural of the Colosseum which stretches across the main wall and gives the ambience of a Roman meal. It is a remarkable work of art, which required the talent of four local artists over 10 nights, and probably lots of coffee, to complete! Speaking of coffee, a’Roma Dinings boasts one of the best cups I’ve had in a long time. 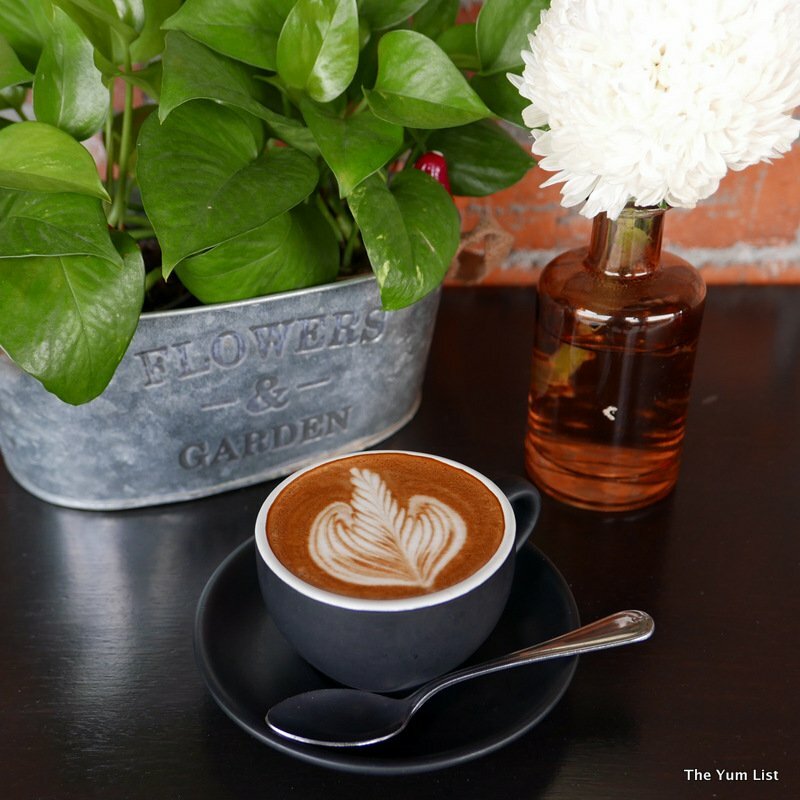 It’s quite rare to find good coffee in a restaurant, as opposed to a KL café, so I was impressed to find they were serving strong De Gayo coffee with the added bonus of a chocolate chip biscotti on the side – a secret recipe from the owner’s wife. 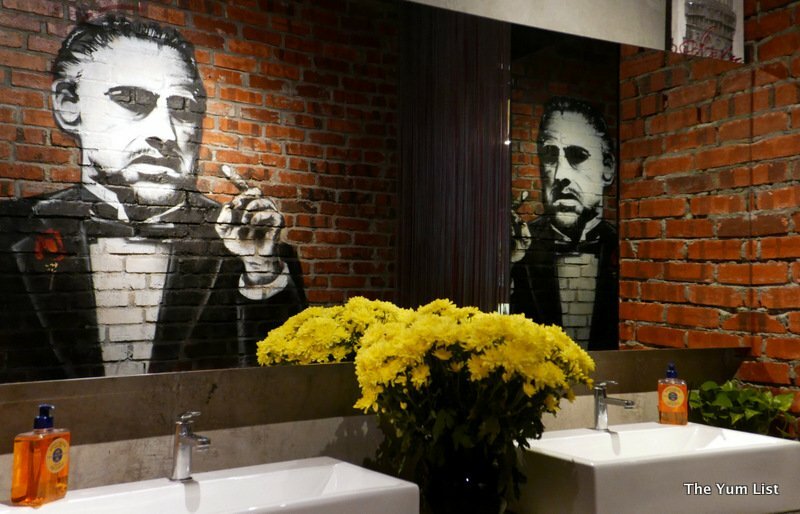 The restaurant is poised to please both eaters and drinkers with an outside lounge area for smokers that has a live band on Fridays and a DJ set on Saturdays. 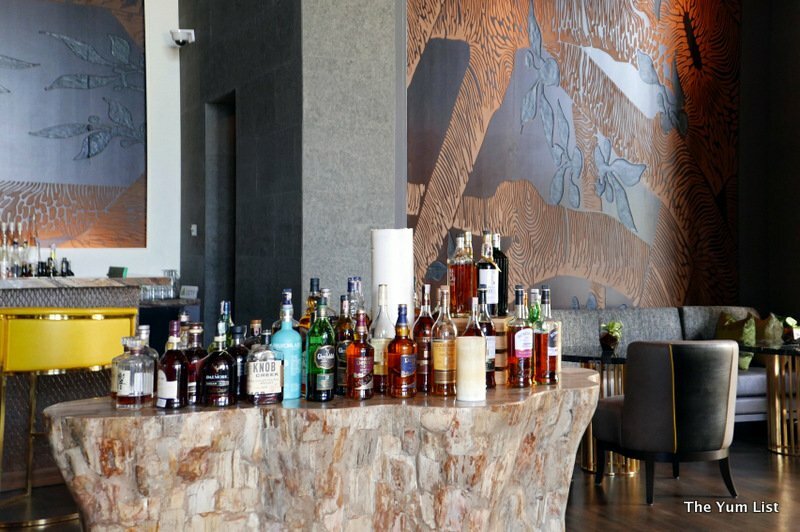 The well-stocked bar has an array of value for money drinks, including a wide range of Italian wines and some hard to find whiskeys, without the hotel prices. We began nibbling on their thin and crispy homemade focaccia with a tomato, chili and garlic sauce that had a good kick and would definitely keep the vampires at bay. 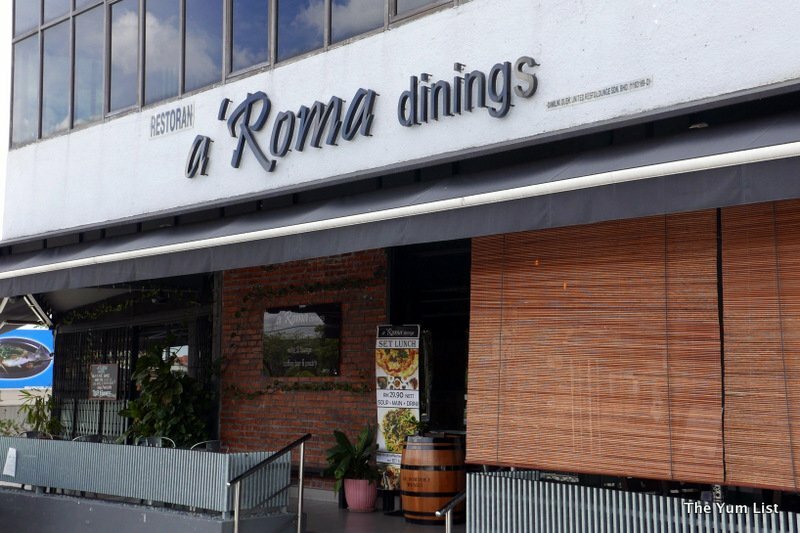 A’Roma Dinings is proud to say that 95% of the menu is made in house including all sauces, breads, pastas and desserts, and you can really taste the difference in flavour. The Insalata Caesar (RM30) was brimming with romaine lettuce, Milano salami, a perfectly cooked soft boiled egg, real bacon chips and large, home-made crispy croutons. The smoky salami slivers and chunky croutons were a nice surprise, and the thick parmesan-laden Caesar sauce certainly didn’t disappoint. Next we moved onto to the Prosciutto E Melone (RM35). 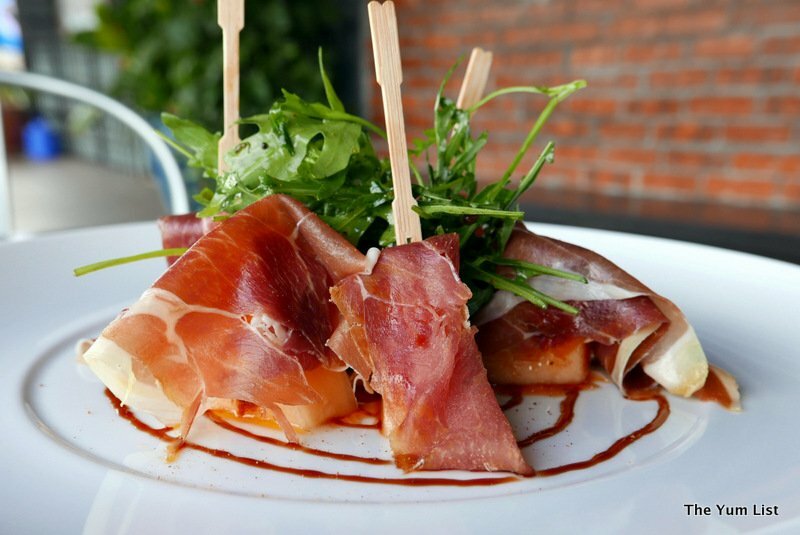 The fresh and flavourful cantaloupe melon was perfectly paired with the dry-cured Parma ham and arugula salad. The sweet and tangy pomegranate drizzle caught my interest as a great addition to this classic combination. Being an Italian restaurant, we had to try the home-made pastas, and both were cooked to Al Dente precision. 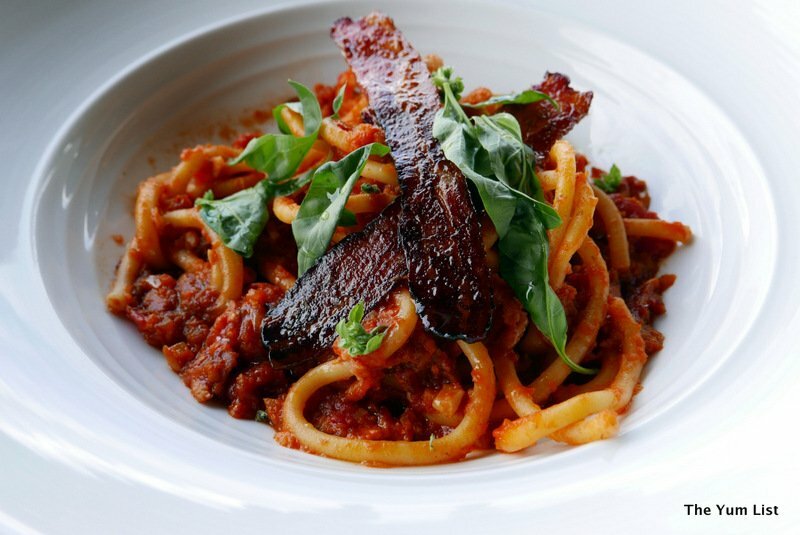 The Bucatini All’Amatricana (RM30) of bucatini pasta in a rich tomato sauce with crispy sautéed pancetta, shallots and lots of garlic was a frontrunner for me. The sweet aroma of fresh basil on top was the best part and the hollow bucatini pasta was not too heavy which complemented the flavourful sauce to a tee. 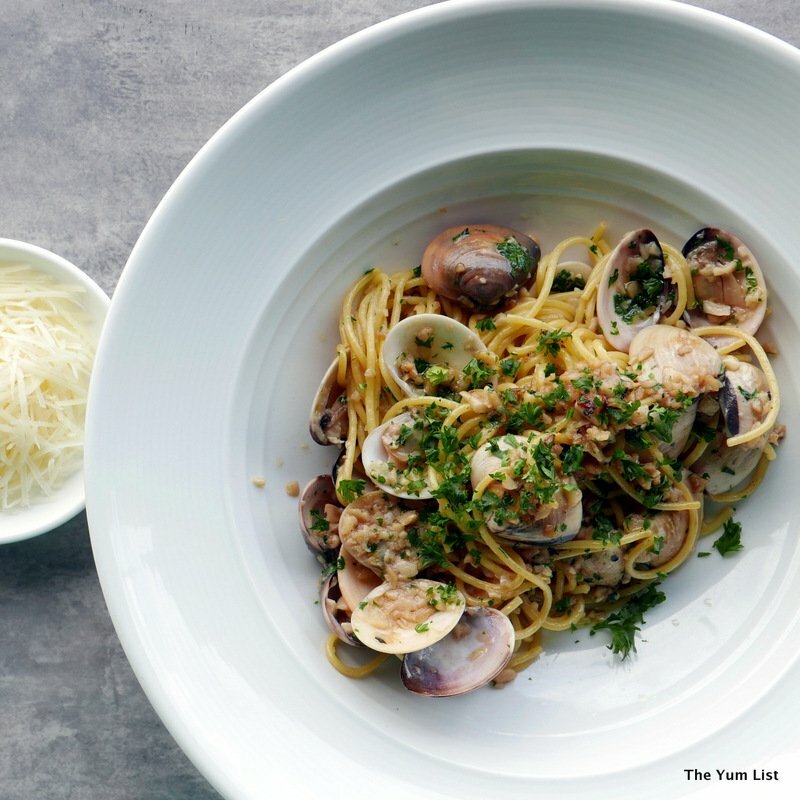 The Spaghettini Alla Vongole (RM28) was a little dry for me but the garlic overload made up for it. 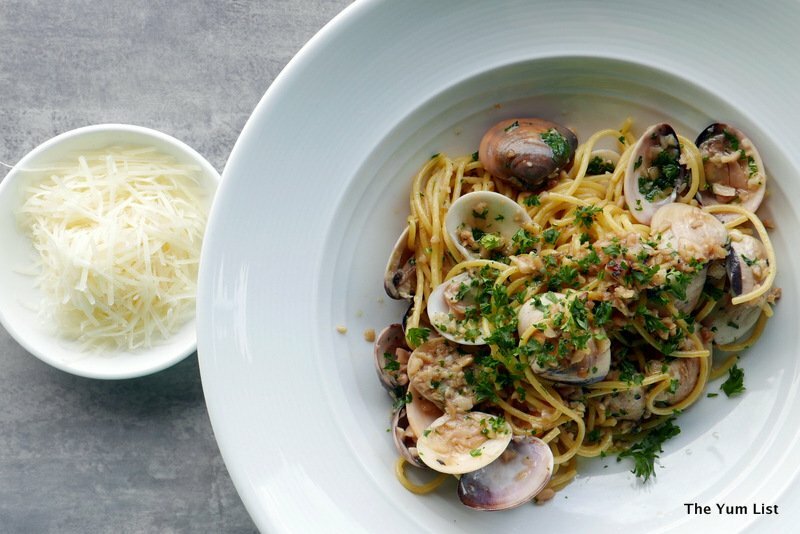 If you’re a seafood fan, you’ll love the deliciously fresh clams in this one. The Costolette D’Agnello (RM78) harissa and herb crusted rack of lamb was undoubtedly my favorite dish. The beautifully cooked tender lamb had a spicy kick from the harissa paste and was served on a bed of creamy mash potato and grilled vegetables. I would definitely go back for this dish again; an excellent mix of ingredients, all cooked to perfection. Despite bursting to the seams, we sampled the Semi Freddo Di Cioccolato (RM23) – a 75% dark chocolate, butterscotch and hazelnut ganache. This chocolate mousse really is the epitome of ‘death by chocolate’, but thankfully the strawberry and orange segments keep it very fresh and not too rich. 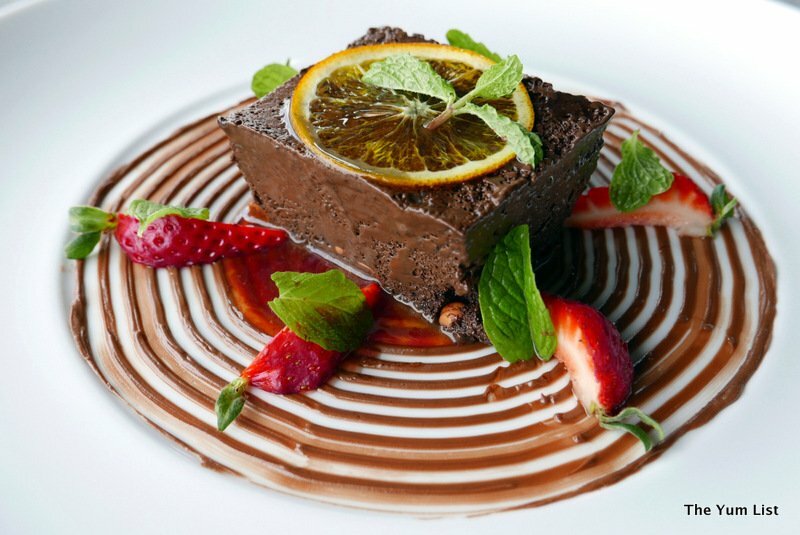 It’s also a great portion size for sharing dessert if you just want to end the meal with something sweet. 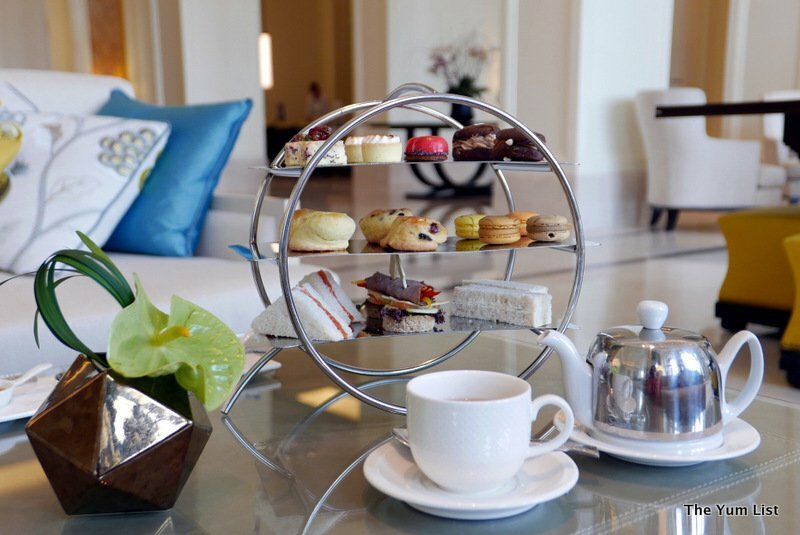 I would highly recommend it with a cappuccino! Gorgeous! Real table cloth! Fresh flowers! Ok, here’s a winner!!! I made myself some clam spaghetti just the other day. Save yourself the trouble, now you know where to go! Is that radish right beside the vongole? julienned Radish? Hello, looks like a lovely restaurant. Italian food is my favorite, YUM! Thanks for sharing! 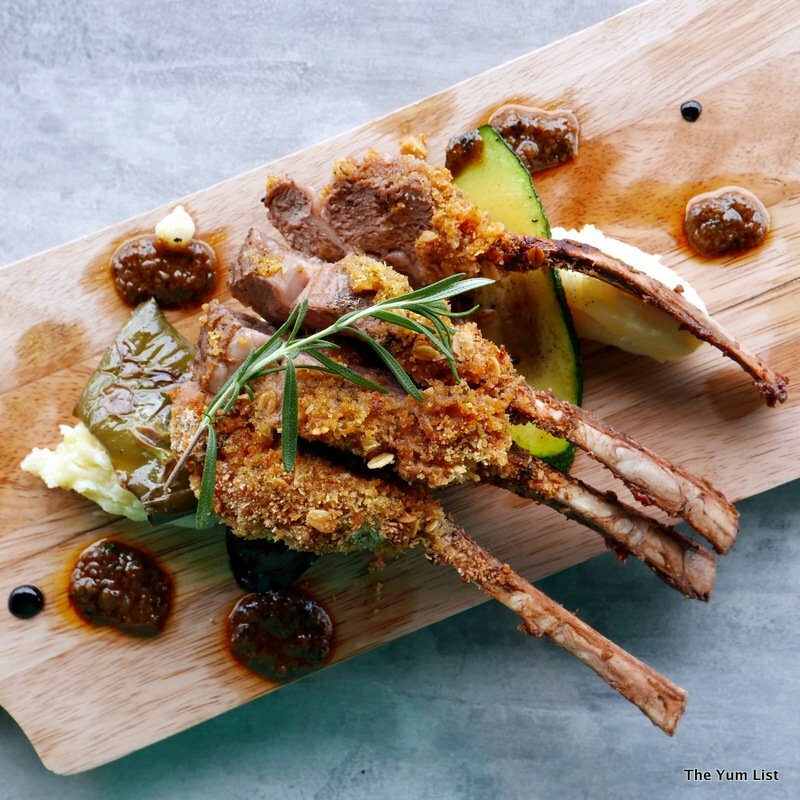 Yums to the lamb rack and chocolate dessert! 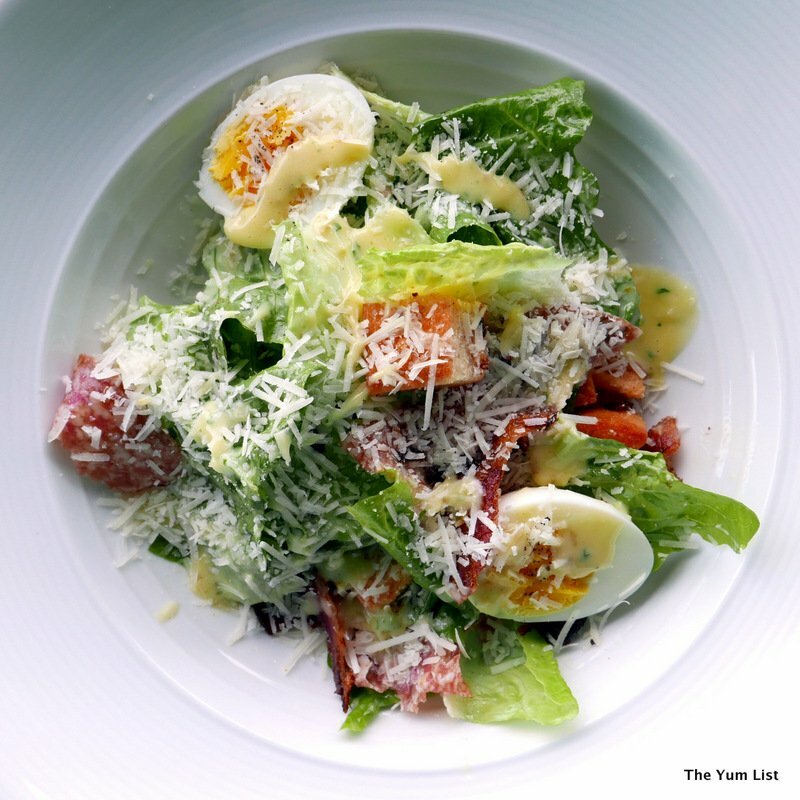 Would definitely love to have a bowl of the Insalata Caesar!